Offering you a complete choice of products which include pp pickling tank and spirall hdpe pickling tanks. We are manufacture PP Pickling Tanks & HDPE Pickling tanks we are manufacture pp tanks as per customer requirement our tank is used in varied industries for pickling process our pp & HDPE pickling tanks are available in different shapes and capacities to meet the diverse needs of the clients. 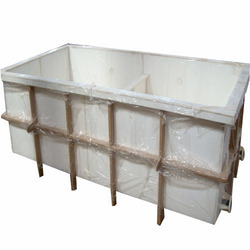 Our organization is involved in offering Spiral HDPE Pickling Tanks to our valued customers. We manufactured these tanks using premium quality HDPE and other material. These tanks are widely used for pickling process or storing highly corrosive chemicals. To match with the international industrial norms, we checked these products on various parameters. Furthermore, the products offered by us are widely demanded in various industrial applications.